In one night, Ravyn’s life plunges from barely tolerable to deadly. Forced to flee the only home she’s ever known, Ravyn stumbles headlong into the clutches of a powerful demon intent on stealing her powers. Unfortunately for him, she has no intention of cooperating. 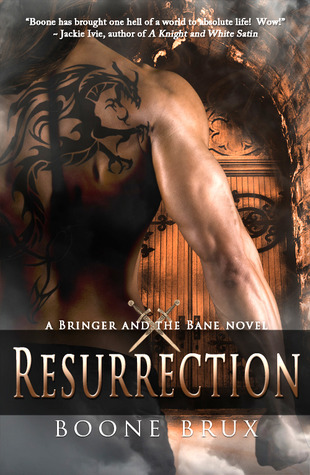 When Rhys realizes the woman he rescued from the Demon Bane is no mere human, his obligation as a Bringer dictates he protect and train her in the ways of his people. But he’s unprepared for the intense desire he feels for the fiery Ravyn. To surrender to his need may mean her death. I have come to understand that this book has been held back for further edits, so my review is based on the unedited ARC I received from NetGalley. This is another book about which my feelings are somewhat ambivalent. In terms of the concept of the book, I really enjoyed it. I like the mythology that Brux created for the world and I felt the idea had a lot of potential. The premise of a group fighting a 'demon' threat is fairly common just now, but Brux gives her own take on it with some great, fresh ideas. Somehow this story just fell a little flat for me though. I didn't hate it, and I found the pacing and action good, but I just didn't gel with the characters. I thought I would as I like Ravyn in the opening chapters and I enjoyed her initial interaction with Rhys. But somewhere along the line it just fizzled out for me and I began to lose interest in them. I wonder if it was perhaps the fact they consummated their relationship so early on in the story and then all the sexual tension dissipated and they both just seemed to brood in their own ways until they were suddenly reunited and in love again. So, in conclusion: this is an OK read if this is your preferred genre, but I'm not sure I was gripped enough to rush to read any following books in the series.